You are here: Home / Reviews / Diabetic Dog Food – What’s The Best Choice For Your Pet? Welcome To Our Complete Guide To Understanding Canine Diabetes And Choosing The Best Diabetic Dog Food. Just when you think you couldn’t possibly share anything more in common with your canine bestie, along comes canine diabetes. Yes, it is true, at least in the United States and Europe, diabetes is nearly as common in pet dogs as it is in people! Even more interesting, while most dog lovers may not yet be aware, diabetes in dogs has been studied for nearly a century now, both for its own sake and to learn more about treating diabetes in people, too. From this research, we know today that certain dog breeds are more susceptible to canine diabetes mellitus than other dog breeds. We also know that symptoms of diabetes onset tend to be similar in humans and canines. And we know that medication (insulin) plus diet modification is the most commonly recommended treatment model for both human and canine diabetes. If your beloved furry sidekick has just been diagnosed with diabetes, or your veterinarian is currently testing your dog towards that possibility, you are probably quite worried! You may even understandably be wondering about the impact on your dog’s longevity and quality of life and your life together! You are probably also anxious to find out what lifestyle and diet changes you need to make to keep your diabetic dog as healthy and happy as possible. Of course, it is always best to consult your dog’s veterinarian to make a final food selection for your diabetic pup! Here, we will present for your consideration some of the best dog food for diabetic dogs so you can start learning about diabetic dog food brands before your dog’s next exam. When feeding your diabetic dog, the first step is to build a firm foundation of understanding about your dog’s disease. What is canine diabetes? How does it manifest? How does it affect your dog? Are there different kinds of canine diabetes? What is the best approach to manage the symptoms? So let’s get to work answering these questions! In humans, most of us are familiar with Type I and II diabetes. It was previously assumed that diabetes in dogs worked the same way. Dog diabetes is different, though. Modern research shows us that dog diabetes suddenly occurs in adulthood. This is most likely due to the immune system attacking the pancreas. It can very rarely be managed without insulin, and tends to last a lifetime. Here, diabetes occurs in part via a malfunction in how the dog’s body regulates water. Diabetes effects 0.32% of the dog population. While these incidence statistics may sound quite small, they are sufficient for veterinarians and canine researchers to deem diabetes as “common” in companion canines. As with human diabetes, canine diabetes is considered to be a chronic condition: treatable but not curable. In most (but not all) dogs, canine diabetes mellitus tends to manifest in middle to late life (4 to 14 years) in dogs. Symptoms tend to be similar in both humans and dogs: excessive thirst, increased urination, weight loss/gain, sweet breath, lethargy, vomiting. In canine diabetes, the pancreas doesn’t make enough insulin. Without adequate insulin circulating in your dog’s body, she can’t regulate her blood sugar. Insulin injections are almost always prescribed to add back insulin to your dog’s body. To balance these injections dogs will often eat a diet high in complex carbohydrates. At this time, researchers have identified a number of dog breeds that appear to have a higher risk of developing canine diabetes. This doesn’t mean that these are the only dog breeds that can develop diabetes. It is important to be aware that all dogs have some level of risk for canine diabetes! Female dogs that are not spayed (intact) are twice as likely as male dogs to develop diabetes. Similarly, pregnant female dogs can develop temporary diabetes symptoms, similar to pregnant human moms. You are probably already curious to know what is the difference between regular dog food and diabetic dog food? Generally speaking, diabetic dog food is higher in fiber and lower in sugar is preferred for treatment of canine diabetes. High quality protein and complex carbohydrates (beans, peas, whole grains, vegetables) can also be important. his type of diabetic dog food is preferred because it slows down the digestive response and helps to balance your dog’s metabolism. Diabetic dog food is usually fairly low fat. This is because of the nature of this disease in dogs, not because fat is inherently bad for dogs. Dogs with diabetes often also have pancreatitis. This symptom is difficult to diagnose, so it’s usually assumed in order to be safe. High fat diets can damage a dog with pancreatitis. So this nutrient is kept to a minimum. As well, diabetic dog food is often fed on a prescribed schedule (i.e. not free-fed). 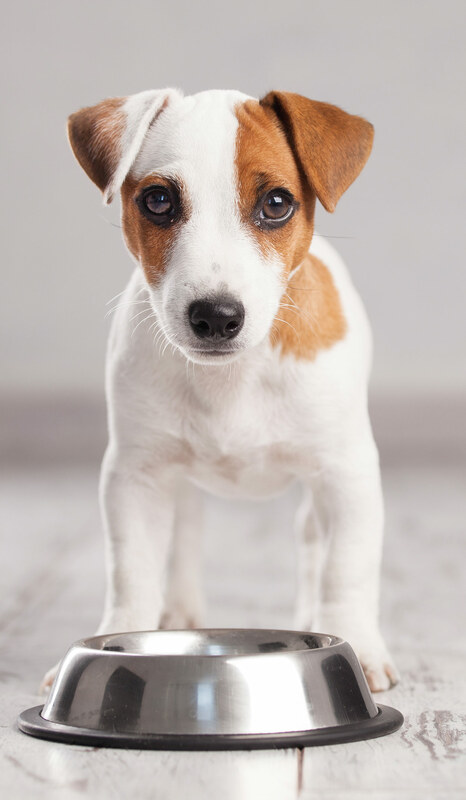 If your dog has been prescribed insulin injections, often you will be asked to feed your dog twice daily just prior to or following each injection. Failing to keep injections and meals together could have nasty results. An insulin injection without food will make your dog hypoglycemic. This is when a dog’s blood sugar drops dangerously low. TIP: If your dog is highly afraid of injections offering the meal after the shot can be a great strategy! Now let’s take a look at some options to choose the dog food for diabetic dogs. Hill’s Prescription Diet w/d Canine Low Fat – Glucose Management Gastrointestinal. This non prescription diabetic dog food is designed to help stabilize blood glucose (blood sugar) levels in diabetic dogs while leaving your dog feeling full and satisfied. It is designed to be a complete and balanced daily source of nutrition for your dog. It comes in an 8.5-pound bag. ROYAL CANIN Glycobalance Dry (7.7 lb) Dog Food. This highly rated dry dog food for diabetic dogs is designed to provide a balanced portion of protein, carbohydrates, fats and fiber to help your dog feel full and enjoy stable blood sugar. It comes in a 7.7-pound bag. EUKANUBA Weight Control Adult Dry Dog Food. This non prescription diabetic dog food focuses on providing plenty of filling fiber plus whole protein and prebiotics for healthy digestion. This food comes in small breed, medium breed and large breed recipes. There is also a prescription version that is specific for weight and diabetic control that you can ask your vet about. IAMS™ ProActive Healt Adult Weight Control. This adult dog recipe is low in simple sugars and lower in fat, plus it is free from artificial ingredients, fillers or preservatives. It comes in regular or large breed recipes. There is also a prescription version that is specific for diabetic dogs that you may want to ask your vet about. Purina Pro Plan Savor Shredded Blend Weight Management Formula Dry Dog Food. This weight management formula is heavy in protein and prebiotics for healthy digestion. The recipe includes dry kibble and meat chunks to make the transition easier. There is also a Purina Veterinary Diet prescription dry dog food for diabetes management to ask your vet about. 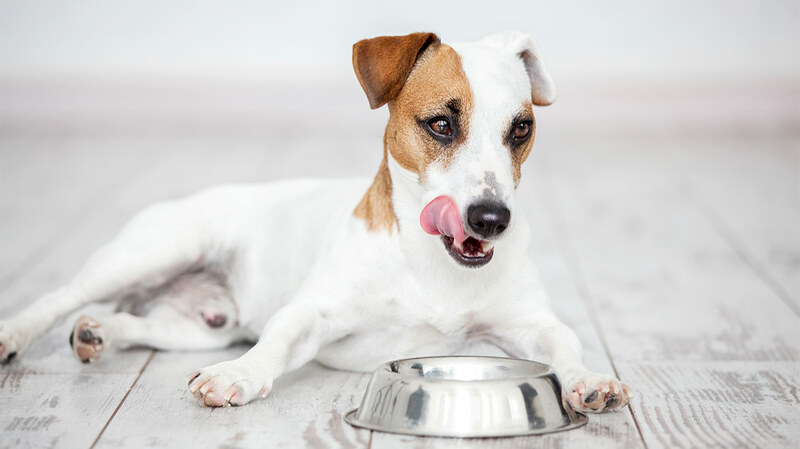 As you are researching your diabetic dog’s nutritional needs, it is important to keep in mind that sometimes the best diabetic dog food brands are sometimes only available through a prescription from your vet. Not all vets recommend or require their diabetic canine patients to eat a prescription dog food, however. If your vet has cleared you to choose a non prescription diabetic dog food, these diabetic dog food canned brands might be a good choice! Also, some vets recommend feeding a higher percentage of the daily diet in wet dog food, since they often have a lower sugar content(i.e. no fillers). Be sure to ask your vet for recommendations on feeding dry and/or wet food! ROYAL CANIN Glycobalance Can (24/13.4 oz) Dog Food. This diabetic dog food canned is designed specifically to help keep your dog’s blood sugar and metabolism stable and balanced. You get 24 cans of 13.4 ounces each. Hill’s Prescription Diet w/d Canine Low Fat – Glucose Management – Gastrointestinal Canned Food 12/13-oz cans. This diabetic dog food canned recipe stabilizes your dog’s blood sugar and improves the metabolism through a special protein and fiber balance. You get 12 cans of 13 ounces each. Evanger’s Gold Super Premium Grain Free Beef Dinner for Dogs. This canned wet dog food has a high protein/low carbohydrate ratio without fillers or known allergens. It is a complete and balanced wet food that meets AAFCO standards for canine nutrition. You get 12 cans of 13.2 ounces each. Only Natural Pet EasyRaw Human Grade Dehydrated Raw Dog Food Formula. This highly rated natural raw dog food recipe may be a good option due to its low glycemic ingredient list. All you need to do is add water to make your own wet dog food at home. There are four different recipes. The 2-pound bag makes 12 pounds of wet dog food. The 7-pound bag makes 40 pounds of wet dog food. CANIDAE Life Stages Canned Dog Food for Puppies, Adults & Seniors, 12 Pack. Canidae makes canned weight management dog food for all life stages, including puppies, adults and senior dogs. Because many dogs are diagnosed as diabetic in middle or late life, this might be a viable option as a source of high protein, low carbohydrate complete and balanced nutrition for your diabetic dog. You get a 12-pack of 13-ounce cans. It is important to talk with your dog’s veterinarian before transitioning a diabetic dog to a homemade diabetic dog food diet. Your vet may have specific ideas about diabetic dog food recipes or may feel this is not in your dog’s best interests. If your vet feels it is a good idea to pursue a homemade diabetic dog food diet ask for some suggestions. The ratio of nutrients may depend on your particular dog. Ruby Stewbie (by My Untangled Life). This low glycemic index and delicious dog stew has been keeping the author’s diabetic dog, Ruby, healthy and happy since 2008. The Diet That Saved My Dog’s Life (by DIY Dog Mom). This balanced diabetic dog diet was provided through the University of Tennessee’s Veterinary Nutrition Service for the author’s diabetic dog, Mylah. Homemade Diets (by Canine Support Group). This detailed and helpful diabetic dog food list gives you the building blocks to begin creating your own homemade diabetic dog food recipes. You will find ingredients suggestions (protein, veggies, fiber) along with calories per portion and glycemic index per food type. While ultimately, your dog’s vet will likely be the one to choose your diabetic dog’s new food, it can be great to have some preferred diabetic dog food brands in mind for your next check-up! You might even want to broach the topic of homemade diabetic dog food recipes and bring in the options listed here as possibilities for your vet to review. And remember, choosing the best food for diabetic dog comes with its own necessary learning curve. We hope this article plus the help of your dog’s vet has made the process feel much less nerve-wracking and overwhelming for you and your pup! Do you have any favorite diabetic dog food brands or homemade diabetic dog food recipes? Please share them – we love to learn from our readers! Cabrero, M., et al, “Pet Diabetes Month,” Merck Animal Health, 2014. Ward, E., DVM, “Diabetes Mellitus in Dogs – Overview & Fact Sheets,” VCA Animal Hospital, 2015. Catchpole, B., et al, “Canine diabetes mellitus: can old dogs teach us new tricks?,” Journal of Diabetologia/Springer, 2005.
,” The Yale Journal of Biology and Medicine, 2017. O’Kell, A., DVM, MS, “Move over mice, canines may be next in line to study diabetes,” UF Diabetes, 2017. Bruyette, D., DVM, DACVIM, “Diabetes Mellitus in Dogs,” Merck Veterinary Manual, 2018. Maggiore, A.D., DVM, DACVIM (SAIM), “Diabetes Mellitus In Dogs and Cats | Diagnosis, Treatment, Prognosis,” Vet Specialists, 2014.